Before taking this FMS class, I had never even heard of Portal before. The concept took a while to understand: imagine having the ability to transport through walls. That’s what defines Portal as a new video game genre which converts 3D spaces into puzzles. 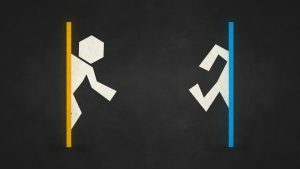 Although this was my first time playing Portal, I found myself frustrated with its “appearance of choice.” In this conext, I define this term as the illusion that provokes immersion and a sense of agency over Chell, the character. Yet, when the player may believe that they are discovering a new way to solve the puzzle, it’s the opposite because almost every move has already been strategically placed by the game designer. If each player were to draw out the game maps and the moves necessary to advance in the game, I wouldn’t expect them to look much different from the game designers’. The game lacks alea, the term coined by Roger Callois for chance (Man, Play, and Game). Although this may not be seen as a bad thing, the game does not convince me to replay it. The story of Portal is interesting, but not as thought-provoking as I would have liked it to be. After having advanced 19 stages of puzzles and destroying the AI, Gladys, the player is awarded with cake. Solving the puzzles was a more rewarding experience than earning cake. The ending is rather sarcastic and almost confirms how Chell, did all of this for nothing nor can it be labeled as a heroine’s odyssey in Henry Jenkins’ terms (“Game Design as Narrative Architecture,” page 6). Although Portal embeds narrative elements within the mise-en-scene, it would be wrong to expect more plot development than spatial exploration from a video game like this. Because there was not much plot in the game, I found it hard to relate to my life. Maybe that’s the point; maybe Portal is meant to only survive in its own magic circle. Roger Caillois, Man, Play, and Games, 1961.